I was quite young when I first learned to play the drum. I took classes at the Ashram and began to play during children’s programs, evening chants, and day-long saptahs. 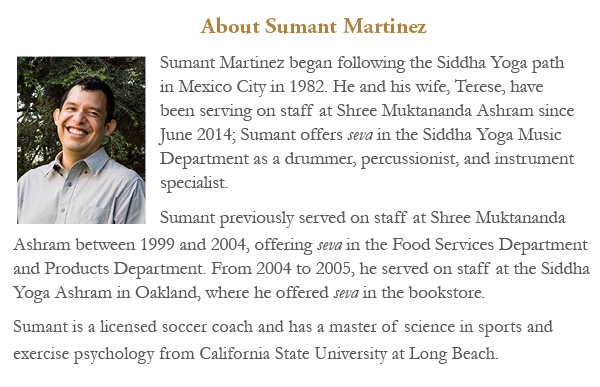 Growing up, I continued to offer seva in the Music Department at the Ashram in Mexico City and at Shree Muktananda Ashram. At that time there were many other activities in my life, so I didn’t take the time to practice much. I didn’t have a mentor or teacher who was making sure that I was practicing, and this lack of practice showed up in the way I played. I was inconsistent—sometimes I would play well but other times not. I never felt that I was proficient and I didn’t feel I was offering my best to this seva. I took her words to heart and began to reflect on them. I realized how important this exchange was because the theme of “practice” runs so steadily through my life. I am a professional soccer coach, and in that line of work we practice nearly every day with the team. So I thought I knew a thing or two about practice. I have often talked to the players about the importance of practice as a means to increase performance on the field. But did I really know what practice meant, on a deeper level? I knew that Gurumayi’s words contained a teaching that would change my life. A year later, in the summer of 2014, I was offering seva at Shree Muktananda Ashram, in the Music Department. My responsibilities included playing the drum during satsangs and practicing every day. For the first time in my life I dedicated myself to practicing the drum in a committed and disciplined way. As I dove into this commitment, I experienced a transformation—not only in the way I played, but also in the way I dealt with the feelings and emotions associated with the discipline of practice. Rather than thinking of it as a repetitive and tedious activity, I started to feel joy arising every time I sat down to practice. I began to continually think about what I needed to work on the next day in order to improve. I listened to recordings of chants in which I had played, to help me identify ways in which I could refine my playing. The best part was in discovering that this focus on practice and improvement was not a limitation but an opportunity to excel and to be the best I could be. Practice was giving me an amazing gift. One Saturday evening while playing in the evening chant, I experienced for the first time a sense of proficiency. As the chant reached its crescendo, I entered “the zone”—I was immersed in the feeling of being fully present in the moment, completely energized, and full of joy. My hands were moving with a skill they'd never had before. Though I was extremely focused, I was not thinking about what to do. Rather, my body knew exactly what to do. I recognized that practice had been the gateway to this state of perfect alignment with the shakti. I was able to offer my best, which brought tremendous joy to my heart. As I reflect on this experience, I realize Gurumayi has been teaching me how to offer seva, and how to perform every activity that I do. Regular practice allows me to find my true potential, to offer the best of my abilities to the Guru, and to everyone, while doing something that I love. I find that I am now motivated to practice because I value the opportunity to discover the greatness inside myself and to offer this to the world. After I read “The Gift of Practice,” I wondered how the teachings reflected in it apply to me and the areas of my life where I want to apply more discipline. It seemed to me that Sumant first opened himself to Gurumayi’s grace. His self-effort included being willing to change the inner attitude he brought to his practice, and he also thought about specific actions he could take to improve his playing. I too want to offer my best, and I am inspired by this Reflection to renew my approach to the work that I do. 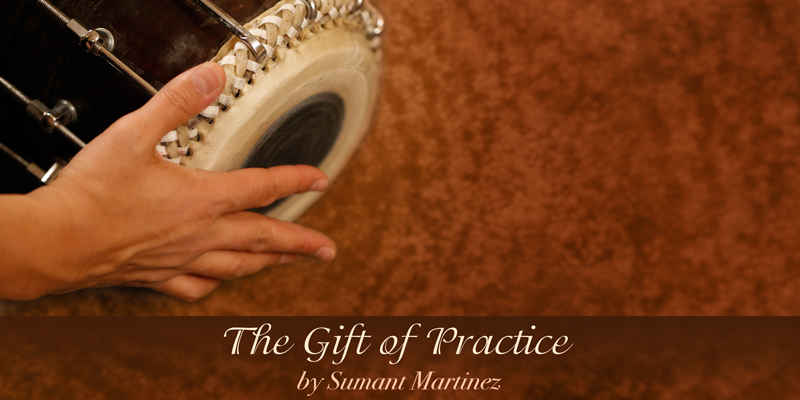 The new Reflection, “The Gift of Practice,” is so relevant to anything we want to master, including our own sadhana. I sent the link to the Reflection to both of my talented grandsons because each of them plays musical instruments. This perspective on practice can help them and all of us to attain mastery in our lives. I will hold it close to my own heart as I approach my sadhana and whatever activities I want to get better at in my own life. Thank you to all of the sevites who support the website and to the Siddha Yogis who are sharing their experiences of Gurumayi.